THIS TOUR HAS BEEN TEMPORARILY SUSPENDED DUE TO THE VESUVIUS CRATER NOT BEING AVAILABLE TO FOR YOU TO TOUR. 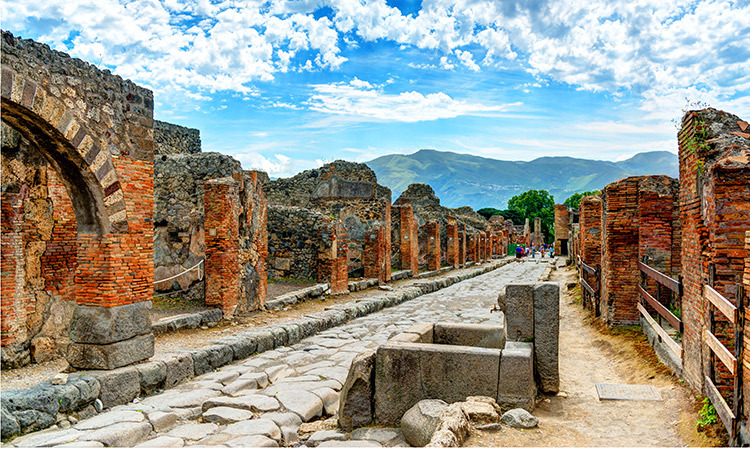 WE RECOMMEND YOU VISIT THE POMPEII RUINS. Our exclusive Show and Go Pompeii and Vesuvius Combo Tour™ invites you to join the tour without a reservation...just show and go. In the ruined city of Pompeii, which was buried by the eruption of Mount Vesuvius in the 1st century, is one of the most haunting and awe-inspiring ancient sites in the world. Your tour provides an in-depth exploration of this singular site—and the rooms, streets, and temples where its residents spent their final moments. Accompanying you will be an English-speaking guide, whose knowledge helps bring this unique site to vibrant life. After touring Pompeii ruins you'll be driven by motorcoach to the top of Vesuvius, the "killer volcano". Once at the top you will be able to reach the crater by foot along a fun trail that gradually ascends. Enjoy breathtaking views across the bay of Naples with Capri, Sorrento and Ischia in the distance, as well as peering into the massive crater! You’ll begin tour at Villa dei Misteri Circumvesuviana train station at the entrance of the Pompeii Ruins. When the volcano of Mount Vesuvius erupted in 79 A.D., it not only completely buried this adjacent city—it preserved it. Today, the excavated ruins here comprise one of the most extraordinary ancient sites in the world. Along with your guide, you’ll roam here through the temples, houses, theaters, baths, and even brothels where ancient city residents spent their days. You'll also see the plaster casts of human remains, which eerily depict the poses—and even facial expressions—of Pompeiians in their final moments. After your tour of Pompeian ruins, you take a all-terrain bus to the top of the Vesuvius. You will hike a fun trail with gradual ascent the craters edge. Enjoying breath-taking views across the bay of Naples with Capri, Sorrento and Ischia! Available tour times from April 17th until October 31st: 10:00 a.m. 11:00 a.m. 12:00 am. 1:00 p.m. 2:00 p.m. Just check-in with our guides 30 minutes before.